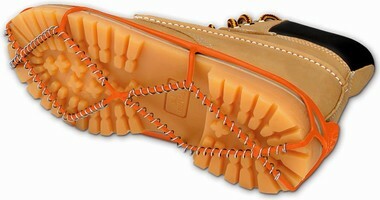 YakTrax®-the newest and most user friendly, cleatless, ice traction device for your shoes today. They are just like putting snow tires on your feet. Stretchy and easy to put on and take off, the outerband conforms to the length and width of nearly all types of shoes and boots. The hand-wound, abrasion-resistant coils give you 360° of biting traction on ice and snow. Walk naturally and comfortably, as you would on a dry surface. Yaktrax® are made for everyone from kids, elderly, runners, walkers, workers or anyone who faces winter elements. Stay safe and upright on the ice and snow with YakTrax®. Call Andax Industries, LLC today at 1-800-999-1358 to get your pair of YakTrax® before winter hits. Safety Shoe combines comfort and modern design. Overshoes resist arcing to 15 kV.